Book Jacket Synopsis: When a little girl in South Carolina finds a rope under a tree, she has no idea it will become part of her family’s history. But for three generations, that rope is passed down, used for everything from jump rope games to tying suitcases onto a car for the big move north to New York City, and even for a family reunion where that first little girl is now a grandmother. 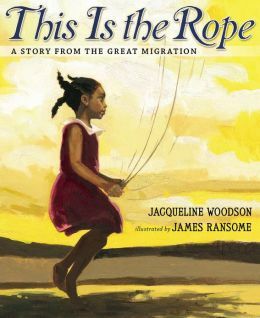 Why I like this story: Jacqueline Woodson calls This is the Rope a fictive memoir. She writes a very lyrical and engaging story based on the dreams of the many African-Americans who journeyed from the south to northern cities from the 1900s to mid 1970s to find better jobs and lives for their families. Woodson’s mother and father left South Carolina in 1968 and moved to Brooklyn. I like how she uses the image of the rope repeatedly as a symbol of family linking one generation to the next. Ransome’s rich and colorful oil paintings vividly highlight scenes of the south and north in an uplifting manner. His double-page spreads are filled with expression and details of each period of history. This is a beautiful collaborative book by Woodson and Ransome. Visit Jacqueline Woodson at her website. Resources: There is an author’s note in the beginning of the book that talks about the great migration of African-American families. Woodson has a teacher’s guide on her website about using her books in the classroom.